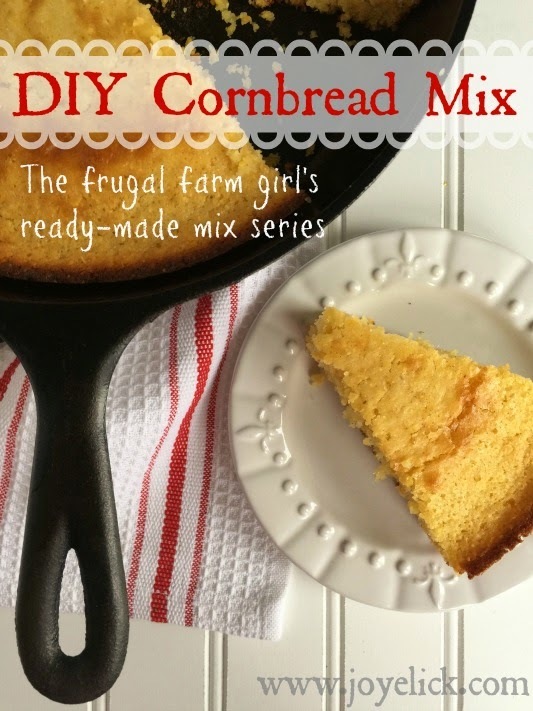 Homemade GOLDEN CORNBREAD MIX (a family favorite): The frugal farm girl's DIY ready-made mix series. You're making dinner. Suddenly, you discover the box of cornbread mix you thought was in your pantry is missing. You look frantically for it. After all, what's chili without cornbread? You know what I'm talking about, right? Those times you feel compelled to run to the store for just one thing. I used to do that all time. I'd feel marooned like if I didn't have that store-bought cornbread mix. Up a creek. Totally bummed. It never occurred to me that I could make my own cornbread from scratch! One day, I got brave and tried making my own cornbread. Since then I've come to enjoy making lots of things from scratch. My cooking tastes SO much better for it! But sometimes, cooking from scratch can feel like hard work. And sometimes, you really are in a hurry, and you'd like to just reach for that old ready-made mix you used to buy from the store. But wait! You don't have to do that. There's a better way: Homemade mixes. That's what the posts in this series are all about. I show you how to preserve a made-from-scratch life, without giving up the convenience you're accustomed to, by making your own baking and seasoning mixes. 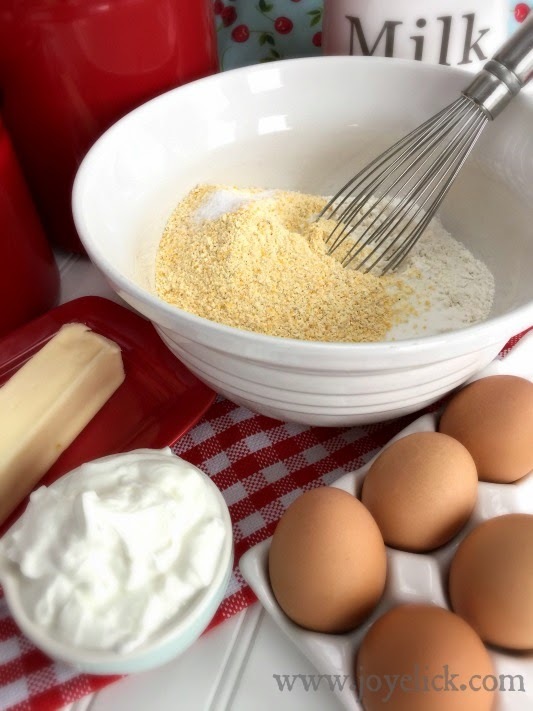 Today, I'll show you how to make homemade cornbread bread mix (and how to make some of the BEST cornbread on the planet! Seriously, it's that good). I've tried lots of cornbread recipes, but this one is my absolute FAVE! It's moist, lightly sweet, and when cooked in cast iron, the crust turns golden brown with a delicious sweet chewy-crunchy texture. (My husband loves this recipe)! Are you ready? Then grab yourself an apron, friend! I'm already in the kitchen! Store the dry mix in a quart-size mason jar, or another air-tight container in your pantry. (Affiliate link leads to a set of 12 smooth surface jars for easy labeling, though the description on Amazon.com seems to be for only 1 jar). PANTRY TIP: Make several batches at once. 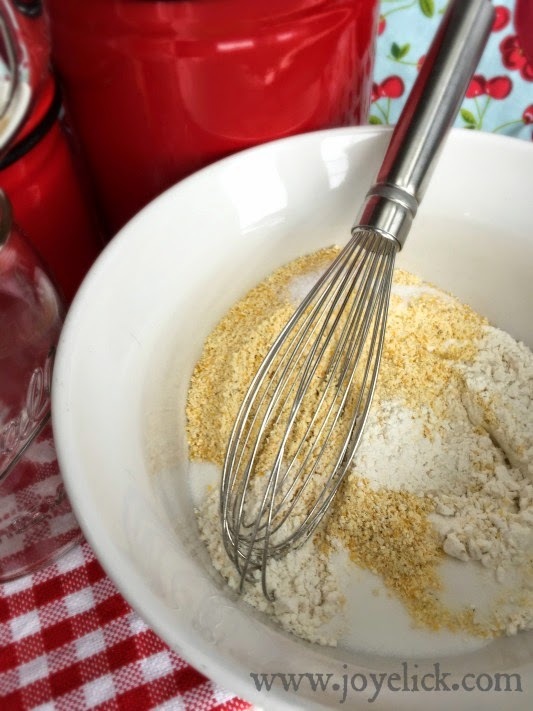 Each jar of cornbread mix makes one batch of bread, so as long as you have the ingredients out, you might as well make up several individual batches at one time. Step 1: Preheat oven to 375 degrees. Spray a 10-inch cast iron skillet with cooking spray and set aside. (I love how this corn bread turns out when baked in cast iron, especially the sweet golden crust). Step 2: Place the contents of your ready-made jar of cornbread mix into a large mixing bowl. Step 3: In a separate medium bowl, combine the wet ingredients with a whisk. Step 4: Make a well in the center of the dry mix and add the combined wet ingredients from the second bowl. Using a rubber spatula, blend everything together, being careful not to over-mix. The batter will be lumpy, which is fine. Pour the batter into the prepared skillet and bake for 35 minutes, or until a toothpick inserted comes out clean. Each mix post in this series comes with a link to a free downloadable page of 8 labels and instructions to attach to your homemade mixes. These labels are simple and easy to read, and done to look a bit retro (which I love) with their lettering and color scheme. Print them onto white card-stock, cut them out, and use double-sided tape to stick them to your jars of mixes. Or, keep it super simple and print your labels onto this sticker paper by Avery. Just cut them out and stick them right to your jars. Enjoy! 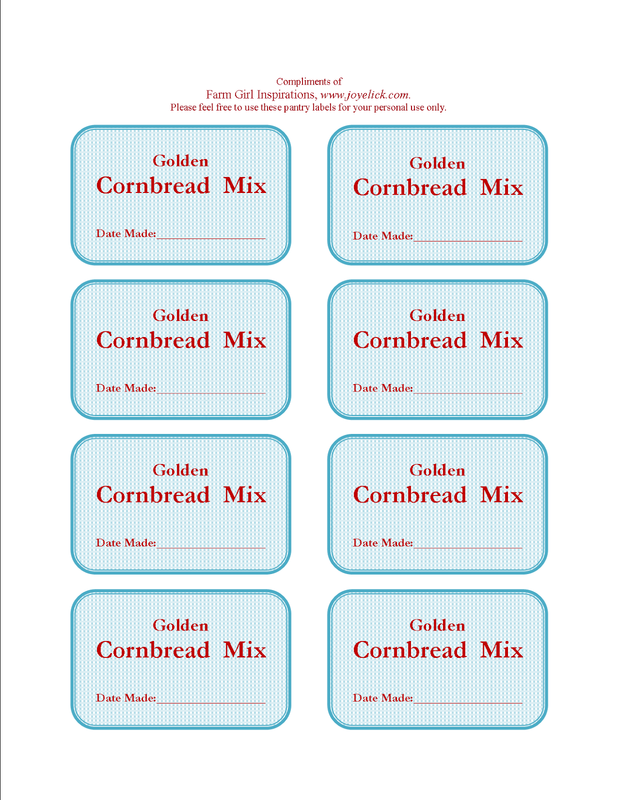 CLICK HERE to download your free Cornbread Mix Labels. 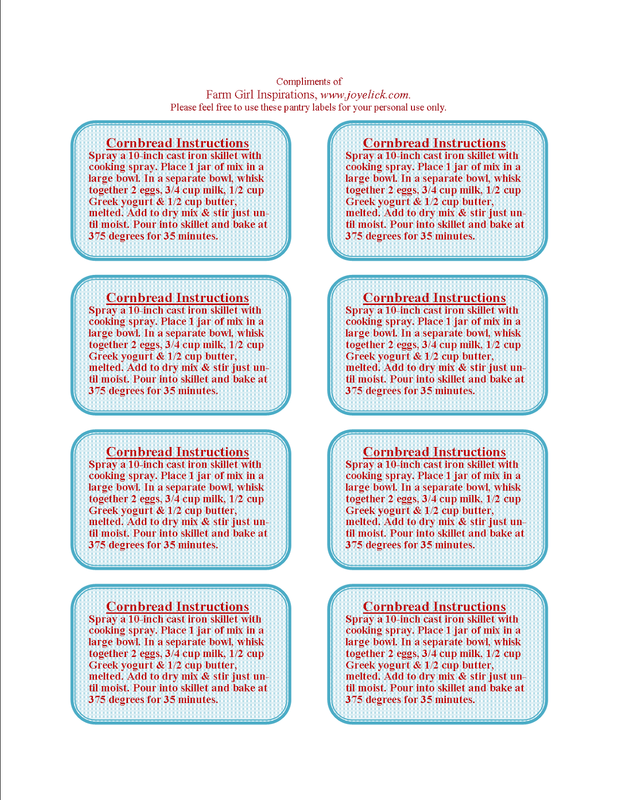 CLICK HERE to download your free Cornbread Mix Instruction Labels. Let's chat: What are some store-bought ready-made mixes you regularly use that you'd like to learn how to make at home? I'd love to hear from you in the comments below! FARMGIRL COOKIE MIX (Not only a great mix, but a great gift idea, too).